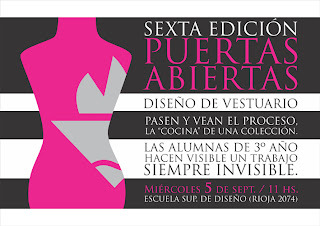 LOS ALUMNOS DE TERCER AÑO DE LA CARRERA DISEÑO DE VESTUARIO ABREN LAS PUERTAS DEL AULA PARA MOSTRAR EL PROCESO,LA COCINA DE UNA COLECCIÓN. PRÓXIMO MIÉRCOLES 5 DE SEPTIEMBRE A LAS 11HS. ESTÁN TODOS INVITADOS! This entry was posted on 6:08 You can follow any responses to this entry through the RSS 2.0 feed. You can leave a response, or trackback from your own site.